Prince William and Kate Middleton are expecting a summer baby. “Their Royal Highnesses, Duke and Duchess of Cambridge are delighted to confirm they are expecting a baby in July,” said a statement released by the Palace on Monday, with Kate believed to be around 13 to 14 weeks pregnant. Congratulations to the couple, I'm glad Kate is feeling better. One way I have learnt to help my hair grow, apart from using hair grow products, is to put it in protective styles. I am one of those people who has a funny habit of picking at my hair, and it is worse when in an afro. My fingers seek out the tangles, multiple and single strand knots, and before I know it, break and pull off the hair. No one has to tell me this doesn't help so I usually put my hair in corn-rows. But that was getting too repetitive, and my hair has now also become so long and full that breaiding it has become a arm-breaking chore. I had to find another way, and I did. 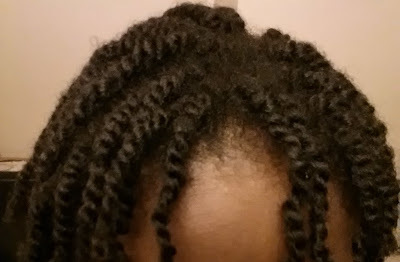 Several blogs mentioned two strand twists and after watching my stylist do it a few times, and seeing some tutorial videos on Youtube, I decided to give it a try. Two strand twists are surprisingly easy to pull off. After adding cream to two sections of hair, you twist them around each other till you get to the tips. If your hair is as curly as mine, the ends will hug each other and ensure the strands don't spring apart. The pictures are of my homemade twists after some days and I rocked them for a couple more weeks.